"9 year old hits monstrous home run after taking hundreds of swings per week on his RetractOBall..."
When Brandon Woodward came to me for lessons, I gave him the motivational speech I give all my budding hitters, "If you take 100 swings a day, you'll develop into a great hitter." He took me at my word and started bugging his dad to take him to the park so he could get in his 100. 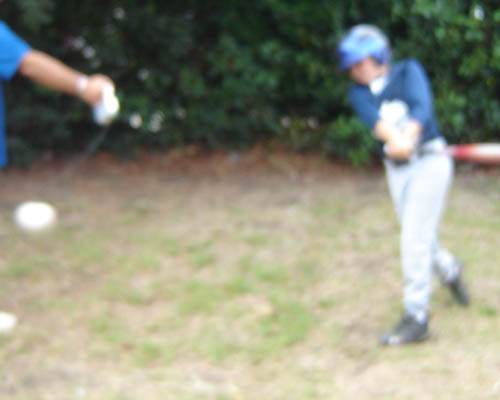 So off the two of them went, Brandon with his bat in hand and all his determination to be a good hitter and practice what I was teaching him and his dad, Richard not far behind with the tee and a bucket of balls. "Thwack", ball goes to center, "Thwack", another to left, and on and on it went until the bucket of 50 balls was empty. Then came the un-enjoyable, but necessary part of picking up all the balls and then doing it again, followed by more shagging balls. Richard is now thinking like all dad's "I'm proud of my son doing all of this, but I'm too old to be stooping down and picking up all these balls. There's got to be a better way." So he puts his machinist training hat on and is inspired to invent something that saves his back, but also cuts the time Brandon can get in his 100 swings in by almost 50%. Now you know the story of how the Retract-O-Ball came to be and all we dads (and moms) and coaches can rejoice! It's perfect for baseball, but also for softball, both fastpitch and slo-pitch. WOW! Getting in 100 cuts (or more) has never been easier. You can position the base of the Retract-O-Ball at the bottom of the tee, place the ball as normal on the tee, your player hits it, and it goes out 10 - 20 feet and returns to the base of the tee, ready to be placed on the tee again. You no longer have to even go to the park, you can do this in your own yard or even indoors (great for hitting during the bad weather days). And it gets even better as you can use it as a toss device. 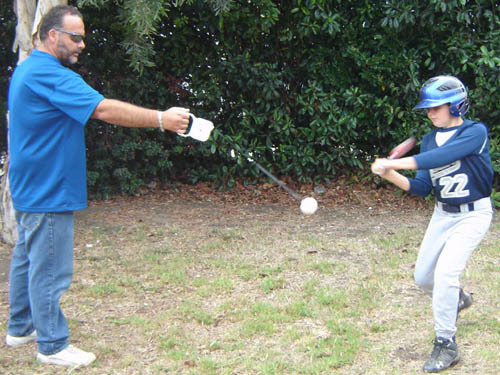 The ball hangs down from the retractoball handle, so it can be gently guided into the strike zone, to where a batter can hit it out in the right trajectory you're trying to hit it and it springs back ready for the next toss. You can now hit a moving ball and not have to shag it or even pick it up. 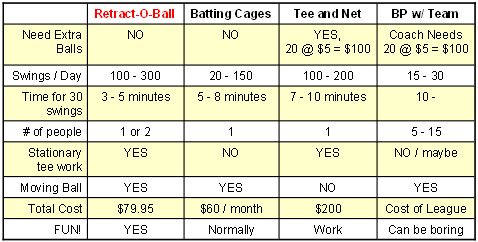 You don't even need the expense of a net or a batting cage to use the Retract-O-Ball. 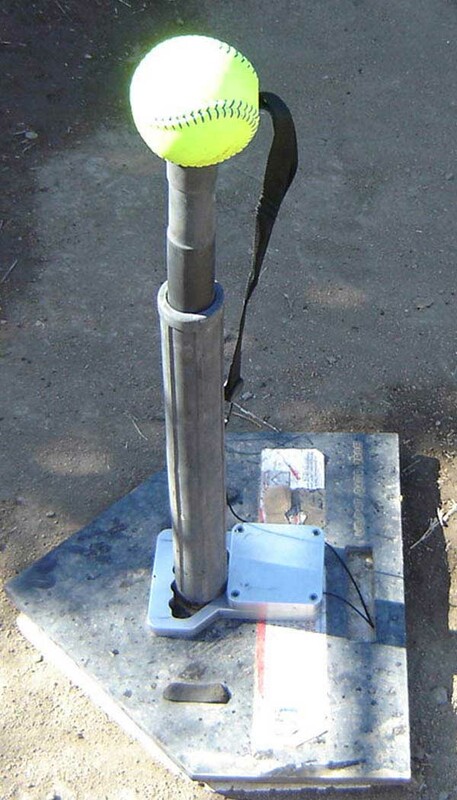 You don't have to pay for any gas going to a batting cage or field, you can do it at home or at the team's practice, making it the most cost effective hitting aid on the market today! The cap of the retractoball is made of industrial-grade anodized aluminum, with a base of hardened plastic, a nylon cord, and a coiled spring, the Retract-O-Ball can be used in small spaces like a garage, a basement, your own yard, and is ideally suited to take to any game to get your warm-up swings. "The kids now ask me for more swings on the Retract-O-Ball because it's so much fun," said Richard Woodward. "The Retract-O-Ball enables a player to use all the techniques you teach Andy in the shortest period of time and they can do this indoors or out. It brought a tear to my eye, watching Brandon's first home run sail into the infield of the next field, the result of learning the right techniques and taking all those practice swings." And there's no better way to do it than taking your swings off the Retract-O-Ball. Try to do it any other way and it will cost you more money, time, and aggravation. Take a look at this chart. 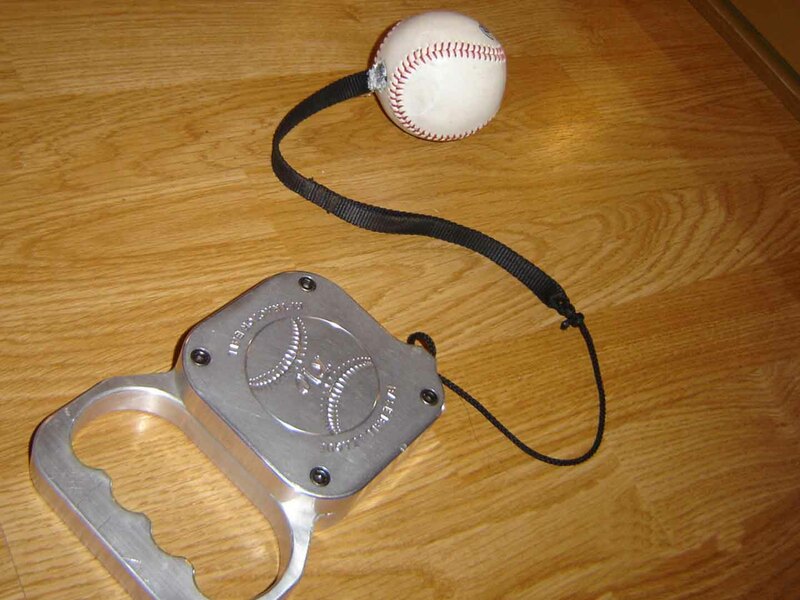 The initial run of the retractoball is limited to 50, so if you're one of the lucky few to purchase one now and after you use it tell me what you think of the Retractoball, I'll send you my new book, "How to Make the All-Star Team", a $20 value. ORDER BEFORE WE RUN OUT!